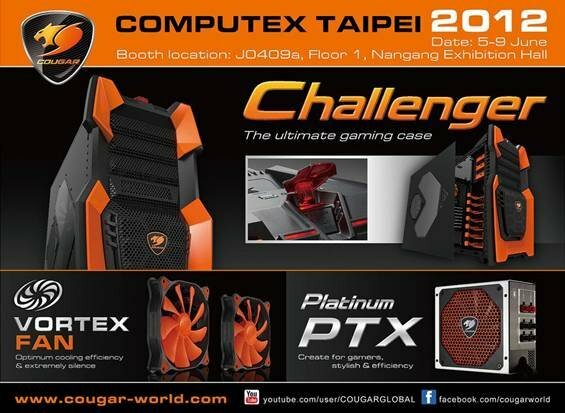 As every year, COUGAR, leading German PC case and power supply brand, will be showing a strong presence at the Computex 2012 Tech Fair in Taipei, Taiwan. At booth J0409a, Floor 1 in the Nangang Exhibition Hall from June 5 through June 9, COUGAR will be challenging serious gamers with their latest high-end PC equipment line-up. Prominently on the floor ground will be the long-awaited Challenger ultimate gaming case, the most power efficient 80 Plus Platinum certified PC power supply Platinum PTX, as well as the patented and award-winning Vortex series of PC case fans. The CHALLENGER mid-tower case is particularly targeting gamers demanding for huge upgradeability capacity, best airflow and optimized ventilation characteristics. COUGAR’s specific black and orange color combination paired with the large metal-mesh front bezel lend it an aggressive yet stylish appearance. But the ultimate design high-light is to be found right on the top of the case: to power up your computer you first have to lift a cover lid just like a pilot unlocks the missile button to fire. A safety feature to prevent accidental touch, which at the same time makes you feel in gaming mode right away. To play even most advanced games, the COUGAR CHALLENGER offers sufficient space for powerful graphics cards of up to 410mm length. This is achieved by a unique 3-Mode drive cage concept. In standard mode there is 300mm of space, by using a special HDD track mechanism you can relocate the drive cage to you gain another 30mm, and when removing it entirely you get the maximum of 410mm. The 80 Plus Platinum certified COUGAR Platinum PTX high-end PC power supply delivers up to 94% ultimate efficiency while supporting PCI Express 2.0 next generation with (6+2) PCIe connector for multi-graphics game play at its best. COUGAR’s intelligent fan control system allows fan-less operation while working lower than 25% of the units maximum output, this ensures totally noiseless computing. Once the power supply surpasses the 25% limit, automatic fan adjustment kicks in, tuning the fan speed according to work load and ambience temperature. As all COUGAR power supplies, the Platinum PTX is also utilizing the patented VORTEX fan technology. For 12V, 5V and 3.3V solid state capacitors warrant for highest durability and un-bursting performance. The COUGAR PTX Platinum is available as 550W and 700W. Version. The patented COUGAR VORTEX fan technology sets itself clearly apart from the crowd by virtue of a unique design approach creating high-vortex-airflow with turbine blades enclosed by an exclusive frame providing for optimum cooling efficiency. This in turn leads to a reduction of the fan speed and thus resulting in extremely quiet operation. The Advanced HDB (Hydro-Dynamic Bearing) guarantees super silent performance with a highly increase lifespan. COUGAR’s temperature-control design automatically adjusts the fan rotation speed according to the PSU temperature. Even on its highest rotating level the fan is still quiet enough to be barely noticeable. COUGAR PSU’s und cases are also shipping with VORTEX fans.